T stands for Trade. T stands for Technology. T stands for Terror. T stands for Twitter. Whether Prime Minister Narendra Modi's Washington summit with President Donald Trump is a success or not depends on which of these Ts you are focusing on. From all indications, there has been forward movement between the two leaders in tackling terrorism and celebrating a shared love of social media conquests (Add a shared dislike for mainstream media). On the other hand, in technology and trade, it seems Trump's "America First" approach seems to have stolen a march over Modi's "Make In India" passion. There has been a lot of focus on the bonhomie between the two leaders, both sons of the soil who have stormed to power in their respective democracies with a mix of native ambition, brusque style and burlesque oratory. A reality check on the outcomes needs a look at the details of the joint statement between India and the US and the deals and announcements taking place in the backdrop of the summit. Overall it does seem that India's relations with the US that went on the upswing during the Clinton Age of the 1990s reached a peak in the Obama era, but is somewhat shaky in the Trump years. Washington's declaration of Hizbul Mujahideen leader Syed Salahuddin as a global terrorist and an explicit joint call to Pakistan to restrain terror is a certain victory for Modi, but one does wonder what this means when banned Lashkar-e-Taiba's chief Hafeez Saeed enjoys political freedom in house arrest and Islamabad flaunts its open embrace of the Chinese dragon's Belt and Road Initiative. In trade, there is much evidence suggesting India is on the defensive. Trump has spoken of a need to reduce US trade deficit, even as news gets out about India shopping for fighter jets and drones that I spoke of earlier. Trump, with an eye on his home constituency, also spoke of India buying 100 passenger aircraft and natural gas in long-term contracts. That may be old hat, but shows positive traction for US interests. On the other hand, you heard nothing about H1B visas for the information technology industry, in which Indian software giants have been facing a new normal of enhanced American protectionism. The joint call for a "comprehensive review" of trade to make it fair and free does not make sense when the US president wants a cut in trade deficit and Congress jams the brakes on visas that boost Indian service exports. There is also talk of increased market access that is a double-edged sword for India. 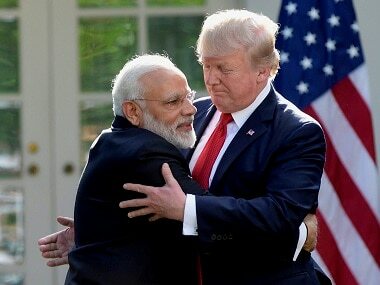 Any artificial balancing of trade deficits by the US that challenges India's competitive advantage in IT goes against free trade while India giving away market access beyond current multilateral principles and domestic interests may pose hurdles to Modi's own plans to boost India's economic growth and strength. Modi assured Washington that he would be a "driven, decisive and determined" partner. The worry for India is that the same adjectives might apply to Trump in his "America First" initiatives that tend to erode India's trade advantages.